There has been a lot of talk in political circles about the economic and employment benefits of the federal stimulus bill (the American Recovery and Reinvestment Act) signed into law in Feb. 2009. Fair enough. But in terms of hardware, Metro benefited from the bill when the first of 50 buses purchased with stimulus money was delivered this past week. The buses are powered by natural gas and will replace 33 diesel buses and 17-propane fueled buses. All the details are posted after the jump. 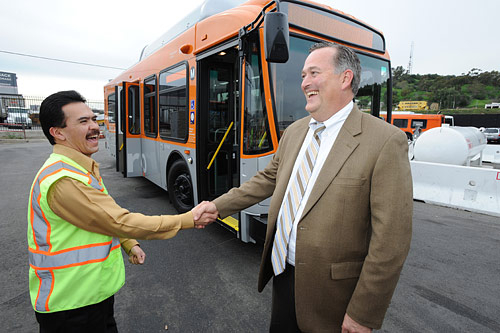 Metro Transportation Contract Services Manager Shannon Anderson Tuesday delivered the first of 50 CNG buses purchased with ARRA funds to Veolia Transportation, one of three transportation providers under contract with Metro to operate 22 lines throughout Los Angeles County. The buses are designated to replace 33 diesel buses and 17 propane-fueled shuttle buses in the fleet operated by contracted services. Veolia will receive 35 of the buses and First Transit, Inc. will claim 15. The delivery of the first bus was met with a celebration in the Veolia Division yard, where a gathering of Veolia employees poured over the new bus, inspecting the shiny new engine, technology features and sleek interior. Anderson thanked Executive Officer Michelle Caldwell, Office of Management and Budget Executive Management, and Countywide Planning Director Gladys Lowe for identifying the bus purchase in an application for ARRA funding, which ultimately rescued the project from dwindling state transportation funds. The Board action in April 2009 provided for the purchase of 50 CNG 32-ft buses in the amount of $24 million. The low-floor, CNG-fueled buses have the same technology features of Metro-operated buses, including an interior video surveillance system. Anderson currently oversees about $40 million in contracts with three transportation providers: Veolia, First Transit, Inc., and Southland Transit, Inc. The companies operate 22 lines with 181 buses ranging in size from 16-passenger vehicles to full-size, 40-foot coaches and account for an annual ridership of some 16 million.